In my building everyone has different door designs, colours, numbers, knobs etc. Our door was in bad shape and in need of some serious TLC. 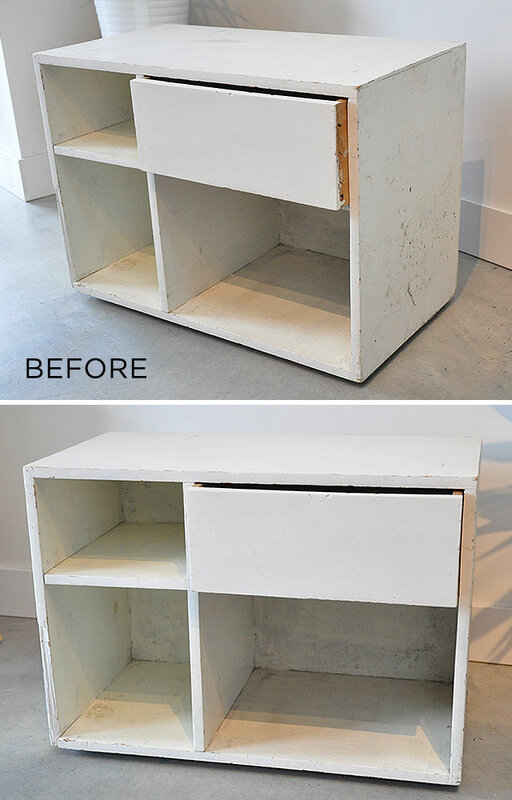 It was painted with a nasty silver acrylic, it had a brushy texture and it was very chipped and scuffed up. To top it off the previous owners were very obsessed with security. They had several locks and barriers around the door. While I do like security, I don’t like how ugly it can be. Unfortunately we couldn’t replace the door, because in an ideal world we’d just have one nice looking knob and lock. But it wasn’t in the budget to replace several knobs and locks, those things are expensive! So we just decided to update the superficial parts of the door, using paint we already had sitting around from our interior. We spent all the money on the numbers, splurging on a custom modern style, we just couldn’t bring ourselves to buy generic ones from the big box store. As you can see I was a bit too excited to start on the project, so I don’t have many before photos. We ripped off the old numbers as soon as the new ones arrived and then realized we should have snapped a photo. We washed the door and scraped off any loose paint. The new numbers came with a grid to align them just right, so all we had to do was drill holes where it was marked. We purchased our modern numbers from Bradford Hardware in Vancouver. Although they were fairly expensive, we think it really adds style to the door. Personally I think the cost of the numbers should be based on weight, because I certainly don’t think the 1 should be the same cost as the 4. Anyway, i’ll stop my rant before it gets out of control. My “after” photos really don’t do the door justice, the lighting in the hallway is very dark and it was taken with my cell phone, but you get the idea. I just really wanted to blog about it while I got the chance. The paint colour is Benjamin Moore Night Horizon in a matte finish. If we had extra budget, we would have bought a semi-gloss paint for the door, just because we’ve noticed it gets very dirty very quick when you rub up against it. 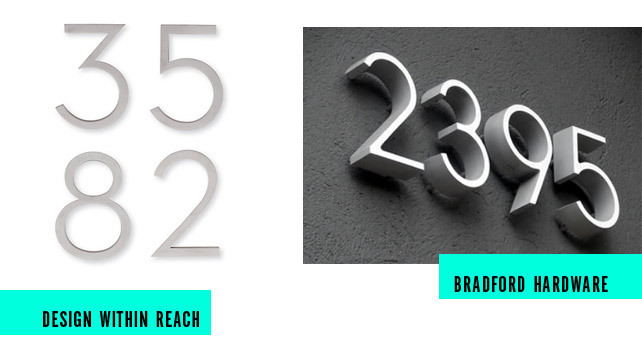 Here’s the 2 places i’d recommend buying numbers from if you feel like doing a mini makeover on your apartment door or house numbers. 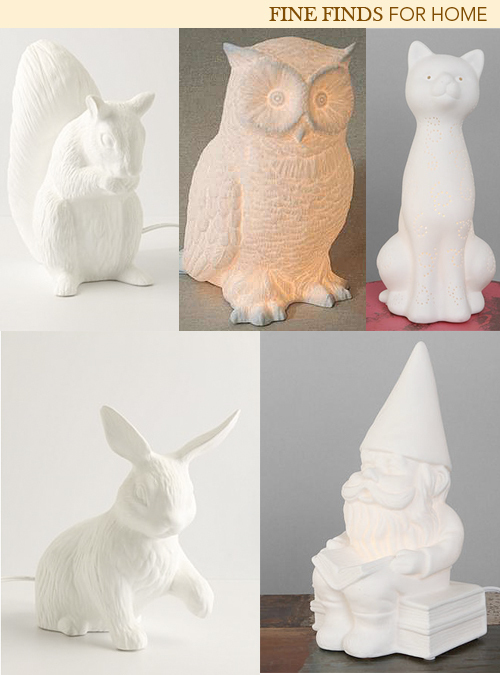 It seems everyone is making animal/creature white porcelain lamps right now. You can find them at Urban Outfitters, Anthropologie and pretty much anywhere else that’s considered trendy. I’m kind of in love with the squirrel and possibly the gnome as a bedside lamp. Would you consider buying these? I’m not sure if i’d love it forever or if it’s just a fad. I’ve seen some of them selling in boutique shops for $300 and over. The average should be $70, but I can’t decide if it’s worth it. Either way, they sure are cute!